The National Deviled Egg Day is celebrated on November 2. This food-related holiday is dedicated to the dish known as deviled eggs, eggs mimosa, or stuffed eggs. The deviled eggs are believed to have originated in ancient Rome where they were typically served as a first course. 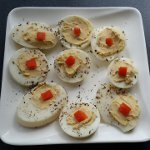 Modern stuffed eggs are commonly served cold as an appetizer, side dish, or a main course. They are a common party or holiday food. Deviled eggs have become so popular in the U.S. that special carrying trays are sold for them. Deviled eggs are easy to cook. First, you need to make hard-boiled eggs and let them cool. Then peel the eggs and half them lengthwise. Mash the yolks and mix them with mayonnaise, mustard, and spices. You can also add other ingredients such as pickle relish, diced olives, vinegar, diced onion, cream, caviar, capers. When the yolk mixture is ready, scoop it with a spoon and pipe back into the halved egg whites. You can top stuffed eggs with bacon, herring, smoked salmon, anchovy, shrimp, or caviar and sprinkle them with dill, chives, curry powder, paprika, cayenne pepper, or Old Bay seasoning. The National Deviled Egg Day is the perfect occasion to throw a party and treat your guests to different kinds of deviled eggs.